Energy development sometimes faces powerful local opposition in communities across Canada. Energy companies have found themselves under the microscope and regulators have been forced to confront their evolving role in this new context. Our new research shows, however, that the nature of this opposition, and the underlying concerns, are often not what opinion leaders and political decision-makers have assumed. Importantly, local opposition is not restricted to pipelines and oil sands, and it is often not about climate change. This is the second and final report from a project designed to understand what drives community confidence in energy project decision-making processes. The project aims to: develop a better understanding of the relationship between local communities and public authorities in energy development; identify reasons for shortcomings; and, develop ideas for restoring that trust and confidence. > What is the level of local community confidence in the actions of public authorities towards new energy infrastructure? > What are the factors that lead to greater satisfaction in local communities with the energy infrastructure siting process? Our findings tell the story of residents, largely in small or rural communities, several of them Indigenous communities, and their experience with regulatory processes. While many commentators continue to assume that concerns about climate change drive local opposition, our research shows that this is not the case. Other factors have emerged as being far more important, including: safety, need, distribution of benefits, local environmental impacts (e.g., water contamination), restrictive consultation/communication practices, and local involvement in decision-making. 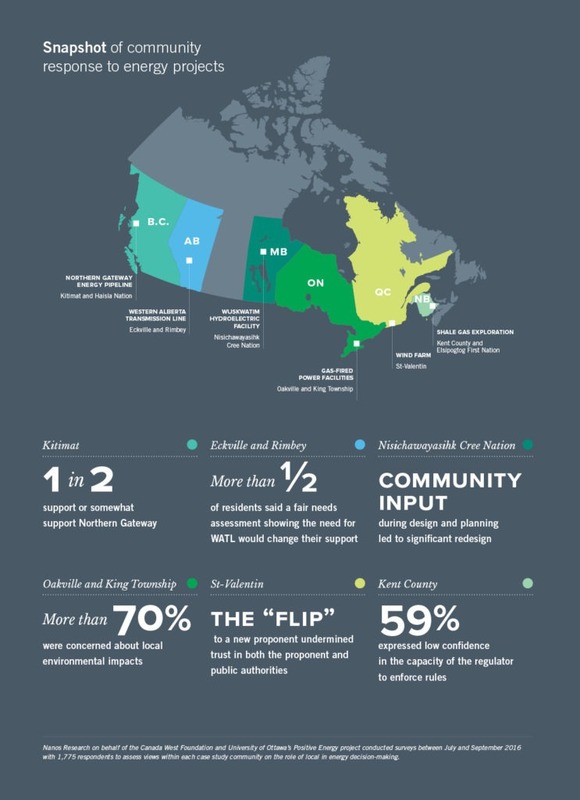 From shale gas exploration on the East Coast to wind farms in central Canada to a proposed pipeline terminus on the West Coast, local authorities and communities are demanding an increasing role in how economic and environmental decisions by third parties affect their future. One thing seems very clear: The world of elite, centralized decision-making without local engagement is fast becoming a thing of the past. want greater detail are encouraged to read the full case studies, which are published separately. > CONTEXT MATTERS. In all the case studies, various contextual factors governed the degree of community confidence in the process and outcome. Key factors include legacy experiences with past projects, and the local and rural culture that creates a context in which the energy project and regulatory process are inherently intrusive. We need to build flexibility and understanding into processes to respond to diverse realities. > INTERESTS, WHILE IMPORTANT, PLAYED A SECONDARY ROLE TO VALUES. Negotiable factors, such as jobs, community investment and resource rents, were secondary compared to values. 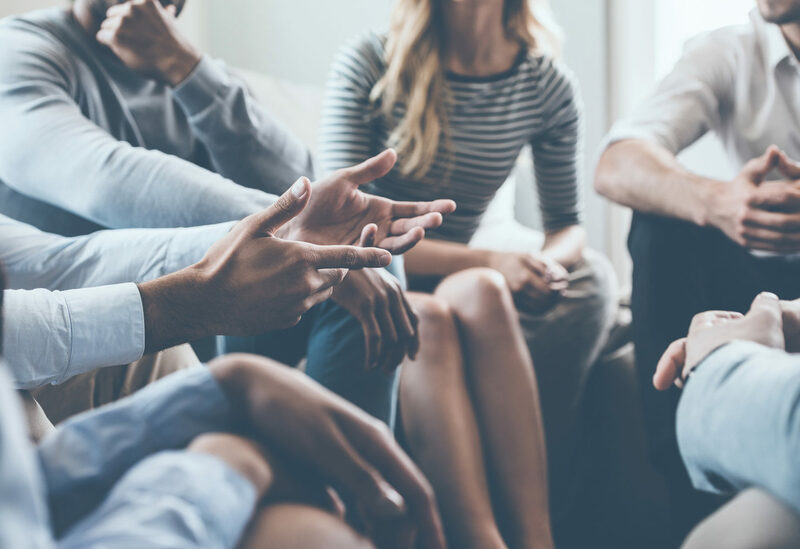 There are cases where deeply held values – such as a natural environment, traditional lifestyles or the importance of being treated openly and fairly – dominate community views. It is clear that speaking to economic interests alone will not shake people from these values. > INFORMATION MATTERS BUT ENERGY LITERACY IS NOT THE ISSUE. Broadly speaking, the case study communities acted to inform themselves and approached the issues with some measure of objectivity, but the timing, channels, sources, and the nature and quality of the information affected community confidence in the decision- making process. While there is no ideal information strategy, the “information about information” – who has it, where it is, how one gets it – matters from the outset. > ENGAGEMENT HAS TO BE REAL AND EARLY IN THE PROCESS. Across the six cases, engagement took many different forms but came up short in several respects. Engaging the community should be about more than notices and a few town hall meetings. It should involve real consultation with the possibility that plans may change. Going further, it can involve true collaboration, with the community acquiring a substantive role in the process, including the creation of the regulatory framework and possibly a direct stake in the project. Arguably, at the core of all of this is the widespread and seemingly growing perception that many of the institutions whose deliberations and decisions will determine our energy future lack the independence or competence to do their jobs – put simply, are often not trusted. At the deepest level, Canadians have a shared interest in restoring that trust. Our recommendations centre on that basic goal. Communities, and especially Indigenous communities, will insist – and do so with success – that the public policy rationale for new projects be well-articulated and debated in the public domain. It is unclear how far policy clarity will go toward defusing local, project-specific objections but at least it would provide a better foundation for objective debate. Aside from big questions about climate change and the future of Canada’s single largest export industry, there are many public policy debates that warrant larger discussion, including the distribution of benefits; regional planning; finding an appropriate balance between local concerns both substantive and procedural and the larger public interest in providing access to energy supplies. The regulatory system is complex, with many different bodies interacting with each other and with the policy system. Governments have in recent years attempted to develop one-stop-shopping, simplifying the system and making it more expeditious. The results, however, have in many cases been counter-productive. If anything, future systems will be more complex and multi-dimensional and the challenge will be to plan for that rather than have it happen willy-nilly. We need to rethink the basic idea of the independent regulator, and the means by which regulators are appointed, restoring legitimacy and ensuring effective and productive relationships between regulators and policy-makers. We need to develop new, flexible and credible means of engaging outside the formal processes, and innovative approaches, such as regulatory co-creation, to include civil society organizations and communities within formal processes. Indigenous governments and local (municipal) governments1 are taking a growing role in thinking through their economic and energy futures, but government decision-making processes were established long before this reality emerged. We need to think through the fundamental importance of community planning and the appropriate powers and roles of local authorities in project decision-making. Further, we must consider the means by which Indigenous and municipal authorities are directly engaged as part of the larger decision process as partners, resources and advisers. Set against that is the question of when and under what circumstances it is the responsibility of a local community to defer to the interest of the broader society. Canada, for all of its aspirations on energy, is somewhat poverty-stricken with respect to energy information, particularly compared to the United States. More information will not by itself overcome problems of trust or failure to design viable decision processes but its absence will almost certainly make problems worse. That is why there is a need for a better Canadian energy information system, and a need for every decision process to be accompanied by a strategy specifically aimed at establishing a trusted information system, ideally one focused on engagement. None of this will come about easily or without cost. These sorts of decision processes will be more time-consuming, may constrain political choice and require administrative resources. They will entail potentially significant additional costs for projects to accommodate local concerns. They will require patience, particularly as Canadians contemplate the transformation of their energy systems to low-carbon configurations. And they will entail tough political choices when real trade-offs have to be made or when the wishes of local communities cannot be reconciled with the interests of the broader society.